Tart cherries, also called sour cherries, are grown in several regions of the United States. Cherries are naturally low in fat and calories, making them the perfect addition to any healthy eating plan. Eating fresh cherries is the best way to benefit from the fruit's health properties, but people often find cherries too tart for everyday consumption. Tart cherry capsules provide a concentrated easy-to-take form of cherries and help provide the same health benefits. Tart cherries are often recognized by their bright red coloring, which occurs naturally due to phytochemicals that not only give cherries their bright red color but are also rich in antioxidants. Tart cherries are a rich source of potent antioxidants, such as anthocyanins, flavonoids and melatonin. Antioxidants have many important health benefits, including fighting free radicals, improving heart health and reducing the damage caused by various diseases and environmental toxins. Tart cherry capsules contain a concentrated form of the fruit and provide the benefits of cherries in the form of a supplement. Cherries are also a great source of vitamin A, C and E, which also have antioxidant properties and help shield the body from the effects of aging. Heart disease is the number one killer of women and a leading cause of death for men in the United States. "The University of Michigan reported at a 2009 Experimental Biology meeting that new research by the university revealed that after eating a cup and a half of tart cherries, study participants experienced a surge in antioxidant activity, reducing risk factors for heart disease and inflammatory disorders. Previous studies performed by the University of Michigan linked tart cherry phytochemicals to significantly lower cholesterol levels and reduced levels of other unhealthy fats that have a negative impact on the circulatory system. Many people consider the tart cherry fruit to be one of the best fighters against inflammation. Tart cherries contain anthocyanins and bioflavonoids, which inhibit certain enzymes that cause inflammation in the body. These phytochemical antioxidants are believed to act similar to aspirin, ibuprofen and other anti-inflammatory medications, but without the side effects. Cherries have a short growing season, so many arthritis sufferers choose to take tart cherry capsules or drink tart cherry juice. Although more research is needed to prove that tart cherries are effective for fighting inflammation, many people suffering from gout, arthritis and other inflammatory diseases stand by its effectiveness. Tart cherries contain melatonin, a naturally occurring antioxidant that balances the body's circadian rhythms and helps regulate sleeping patterns. The benefits of getting a good night's sleep are endless, and tart cherries are one of only a few foods that naturally contain melatonin. Our level of melatonin fluctuates with age, so tart cherry capsules could be especially beneficial later in life, when levels are believed to decrease. You can find tart cherry capsules online and at most health food stores, but check with your doctor before taking any new supplements. 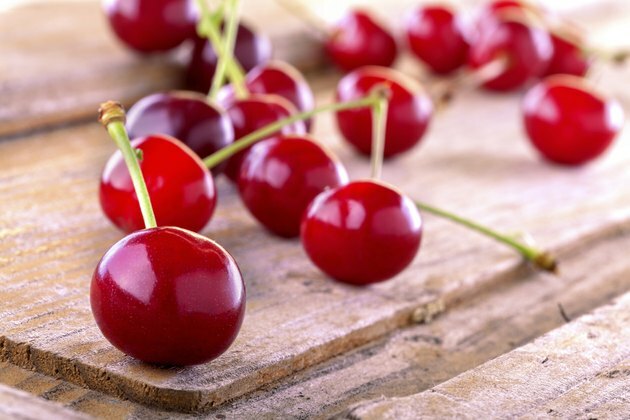 What Are the Benefits of Cherry Fruit Extract? What Is the Nutritional Value of Black Cherries?